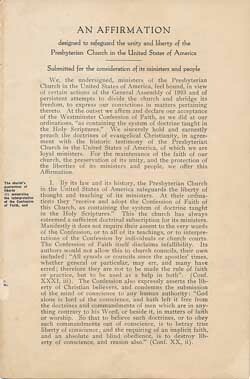 The document known as the Auburn Affirmation was presented to the public in January of 1924, bearing the signatures of 150 Presbyterian pastors and elders. But just four months later, on May 5, 1924, that list of signatures had grown to 1274 names, a significant percentage of the pastors and ruling elders of the Church as that point in time. How many more might have signed had it been convenient, and how many more were complacent or apathetic about the matter? In sum, the Auburn Affirmation attempted to reduce orthodox Christian doctrine to mere opinion and theory. As much as all of this was a shame upon the denomination, perhaps the greater shame was the almost entire lack of response from theologically conservative Presbyterians. They were caught flat-footed and unawares. Of those that did take notice, most thought that the Auburn Affirmation was just a flash in the pan and would come to nothing. Remarkably, substantive discussion of and opposition to the Affirmation was not voiced until almost a decade later. That was in 1910. Such was the state of the Church that the General Assemblies of both 1916 and 1923 were compelled to reaffirm the Doctrinal Deliverance of 1910. Thus it can be seen that the 1924 Auburn Affirmation was written almost entirely in opposition to this Doctrinal Deliverance. Sadly, by 1927 the General Assembly overturned the Deliverance with the conclusion that the Assembly cannot mandate certain doctrines as “essential and necessary.” In so doing, the 1927 Assembly effectively loosed the Church from its moorings. 1. It is an essential doctrine of the Word of God and our Standards, that the Holy Spirit did so inspire, guide and move the writers of the Holy Scriptures as to keep them from error. Our Confession says [Chapter I, Section 10]: “The Supreme Judge, by whom all controversies of religion are to be determined, and all decrees of councils, opinions of ancient writers, doctrines of men, and private spirits, are to be examined, and in whose sentence we are to rest, can be no other but the Holy Spirit speaking in the Scriptures. p style=”text-align: justify;”>5. It is an essential doctrine of the Word of God as the supreme Standard of our faith, that the Lord Jesus showed his power and love by working mighty miracles. This working was not contrary to nature, but superior to it. “Jesus went about all the cities and villages, teaching in their synagogues, and preaching the gospel of the kingdom, and healing every sickness and every disease among the people” [Matthew 9:35]. These great wonders were signs of the divine power of our Lord, making changes in the order of nature. They were equally examples, to his Church, of charity and good-will toward all mankind. Resolved, That, reaffirming the advice of the Adopting Act of 1729, all the Presbyteries within our bounds shall always take care not to admit any candidate for the ministry into the exercise of the sacred function, unless he declares his agreement in opinion with all the essential and necessary articles of the Confession. As the Rev. Bill Iverson is fond of saying, “God has no grand-children.” By that Rev. Iverson means that the work of evangelism must be done afresh in every generation. The Church can never rest from that good work. And we must constantly bear in mind that salvation belongs to the Lord. Our preaching and our witnessing must be done in complete reliance upon the Lord to bring about conviction of sin and conversion to saving faith. If the Church strays, it is because the people have strayed.